We came back from SXSW a few weeks ago. Noggins full of ideas, headaches and other good things. Coupon-mania, marketing-babble, and hipster jokes aside, SXSW is still a totally awesome gathering. Overall, this year seemed a bit less tech-y, and more culture-y. And definitely more business-y. But first, a HUGE thanks for Marko, Aris and Orion who put Finn and I up in their South Congress home. Lots of great company, chickens and wine at the Casa on La Mesa. All told, I think we met with reasonable success in all 4 areas. Publicity (Grade B+): Man, it’s a crowded space for those of us launching a location-based app game! We abandoned the strategy of a few years ago (dress up like insane people and do weird stuff like a high-school themed game) in favor of a more directed approach, courtesy of Marie Domingo. The overall approach was slightly less insane/entertaining, but definitely easier on the liver. She targeted journalists and bloggers who wanted to write about The Go Game App and we were particularly happy with Chris Dannen’s Fast Company article. Awesome job Marie! Fittingly, for the Fast Company interview, Finn and I sat on rocking chairs on a porch, pontificating about location-based games like the geezers we are. Lawrence and Punkaj at Double Dutch. These guys create really well-designed custom location-based apps, mostly around conferences like TED. We’re hoping to combine some of our game content with their really functional apps. New/old friends who were always fun to hang with (which we did a ton). Dokogeo: Saul and JP did a great talk on Sat AM. Sadly we had to skip the end, but got to chat a bit with them. Dokobots, their new game is really gorgeous and is one of the best examples of how to make a game that relies on user-generated content, but isn’t poo-poo. The art’s fantastic, and it’s fun as hell. Modern-day craftsmen, them. Gary Vaynerchuk’s talk was a breath of fresh air. Common-sense and really funny advice for the Thank You Economy. Drop a comment and we’ll buy you a bottle of wine. Gabe and Sarah at Meet Gatsby. Our pals from home. They always keep us informed on what’s what and who’s who in this world. 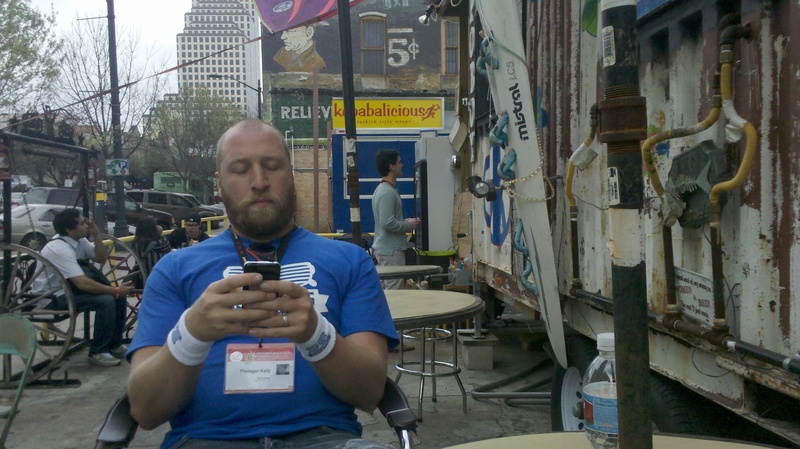 Chris Olson at JESS3 (and former Go Gamer and hardest-working man at SXSW). It was great to catch up with him and hear tales from the trenches of social media. Laura Adams and Dave Cobban at Nike. Turns out Drewstew was Laura’s RA at Stanford. Dave was full of awesome energy about Nike’s huge effort to go totally green. We run games for Nike all the time, so hopefully we’ll see them in Portland before too long. Have Fun (Grade A-): Finn had the masterful idea of renting cruiser bikes. So each morning and night we’d pedal to or from downtown. Fun every time (except when you couldn’t recall where you parked the bike). Saw a great Trombone Shorty show put on by PBS with old pal Glynn Washington. Face melted and got to hang with Mr. Shorty after the show a little — it was as though he attended Vanyerchuk’s talk. He had so much time for everyone, really gracious, hanging at the bar, chatting, effusive with his thanks. Go Gamer Jenny Gottstein was always the life of the party. It’s like SXSW was made just for her. Run a game for Texas Style Council (Grade: A) Jenny rallied hard and wrote an awesome Clothing Swap/Vintage-themed game for our friend Indiana at the Texas Style Council that we ran on Saturday. Good times were had by all!